Regular blog readers might have noticed that I'm just a little obsessed with the ice cream from Ample Hills Creamery in Brooklyn. Well, the good folks at Ample Hills have a stand at Brooklyn's Pier 5 where you can get your dessert fix while you're getting your free movie fix at Syfy Movies With a View series. Each week Ample Hills has been running a fan flavor contest where Facebook fans post their themed flavor suggestions for the movie of the week. Tonight's movie is Rocky and tonight's flavor was created by yours truly! Sweet Freedom: sweet cream with chocolate fudge and salted honey ribbons and homemade honey comb pieces. Veruca Salt'd Crack: salted butter caramel ice cream with crack cookies, salted peanuts (the source of the Salt family fortune) and rivers of hot fudge. Charlie's Golden Ticket: dark chocolate ice cream with chocolate chunks, a fudge ripple and Golden Graham "tickets." PB Rabbit: peanut butter ice cream with peanut butter and fudge swirls and peanut M & Ms.
Pie of the Tiger: Sweet cream ice cream with pumpkin pie pieces and fudge stripes. 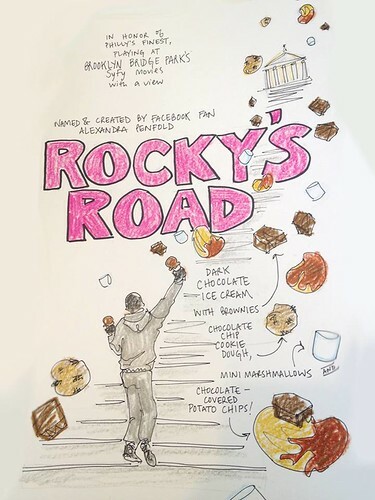 The winning flavor, Rocky's Road, is my twisted take on Rocky Road ice cream. I'm a big fan of ice creams that are chock full of goodies, so this one has brownie chunks, chocolate chip cookie dough, mini marshmallows AND chocolate covered potato chips. The base is Ample Hills' rich dark chocolate ice cream, there's no way this won't be extremely delicious. For my contribution to the Ample Hills flavor vault I win a pint of ice cream (score!). If you want in on Rocky's Road get yourself to Pier 5 TONIGHT. They're scooping limited quantities and when it's gone, it's all gone. Wow! Congrats!!! I totally missed this but all your flavor suggestions sound uh.may.zing. Esp the willy wonka with golden grahams! Breaking: Liddabit Sweets' Store is Opening!! On My Impatient Nature. Also, Book Giveaway! Go Upstate or Go Out East! Just Four Weeks Until The Vendys! !